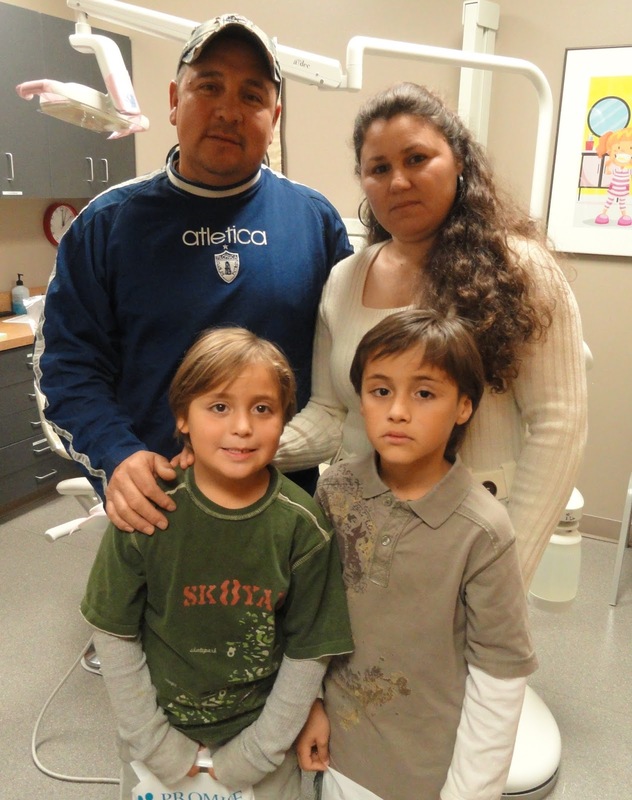 SIOUX CENTER – Pedro and Maria Rodas were happy that they made the 25-mile trip from Sheldon to Sioux Center for dental cleanings for two of their three sons this week. They couldn’t have been more pleased with the service that Alex, 9, and Brian, 6, received during their appointments at Promise Community Health Center. They were referred to Promise by another dental office because Promise is one of the few dental offices in the region that accepts new Medicaid patients, but they found their experience at Promise to be better than expected. She said everyone expects to get attention from their health providers. As a Hispanic family, they expect the same. They don’t want to be treated any differently. Maria said everything was “perfect” since she first called on the phone to make an appointment, but she was particularly pleased when they arrived and were served in their own language, Spanish, by dental assistant Leonardo Gabriel Marquez. She also was satisfied with the service of Dr. Kenneth Tjeerdsma, the dentist at Promise, even though he doesn’t speak Spanish. She said her family will return to Promise again for dental service. “I will recommend it every time we’re asked,” she said. Promise Community Health Center of Sioux Center is the only Federally Qualified Health Center serving the far northwest corner of Iowa. Promise provides medical, prenatal, dental, vision and behavioral health services. To learn more, visit www.promisechc.org and watch this video. SIOUX CENTER – Megan Birdsong likes helping people realize their own strengths and potential and then using that to help them make positive changes in their lives. That’s what she finds rewarding about serving as an outpatient mental health therapist. Promise Community Health Center in Sioux Center. 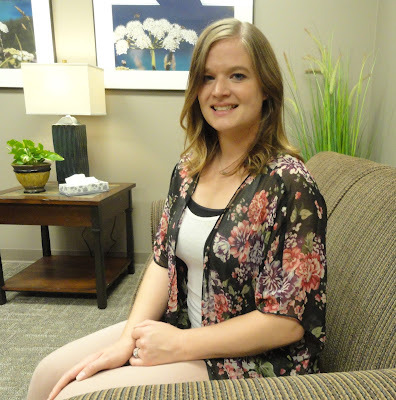 Birdsong, who is licensed master social worker for Spencer-based Seasons Center for Behavioral Health, recently began seeing patients weekly as a therapist at Promise Community Health Center in Sioux Center. Promise, which integrates behavioral health with primary health care, has a contract with Seasons Center to provide the service 1-5 p.m. Mondays. She interned last year with the Maggie Greving, the previous Seasons therapist who served at Promise. When Greving was no longer able to provide therapy services at Promise, she asked Birdsong if she would like to take her place. “I was really excited to be able to do so,” Birdsong said. Birdsong, a 2009 graduate from Unity Christian High School in Orange City, earned her bachelor’s degree in social work from Dordt College in Sioux Center in 2013. She then received her master’s degree in social work from the University of Nebraska Omaha in 2015. Before beginning her service for Seasons in February, she worked for Hope Haven for five years, 2011-16. Here are some of her reflections about serving as a behavioral health therapist and her new role at Promise. Q: What interests you about this opportunity to provide behavioral health services at Promise? A: I am really looking forward to being able to see and help a new set of clients, especially other cultures that I do not always get to work with otherwise. Promise has really great resources for being able to reach all different types of people, and I think that is really exciting. Q: What is behavioral health care in your own words? A: Behavioral health is our mental and emotional health as people. It is the struggles that we have in those areas that can affect our behaviors as well as our physical health. Q: How did you originally become interested in becoming a behavioral health therapist? A: Throughout my undergraduate social work program, we started to learn about behavioral health, and I really actually did not think that it was something that I would be good at. It seemed very overwhelming and challenging, and while both of these are true, during my graduate program I starting getting more exposure and experience in behavioral health and then completed my internship in behavioral health and came to learn that it was something I really enjoyed, and despite the challenges, it is really rewarding. Q: Why are behavioral health care services so important and why should they be integrated with primary care? A: I think behavioral health is so important because our physical and mental health are so interconnected that both need to be treated to really have effective change and continued good health. Q: What do you hope you can bring to Promise in this role? A: I hope that I can really help make that integration with primary care a reality. Promise is great that their primary physicians and now mental health therapists are all in the same place making that integration much easier. I also hope to just help each individual that comes to my office achieve a more happy and meaningful life. Q: What are your impressions of Promise as an organization? A: I really appreciate Promise as an organization. They do so much to reach people within our community that might otherwise fall through the cracks. They have a wealth of knowledge and resources. Promise Community Health Center of Sioux Center is the only Federally Qualified Health Center serving far northwest corner of Iowa. Promise provides medical, prenatal, dental, vision and behavioral health services. To learn more, visit www.promisechc.org and watch this video. Megan Birdsong and her husband, Jordan, live in Sioux Center and have a daughter, Jaila. In her spare time, Megan enjoys reading, spending time with her family and serving as a church youth leader with her husband. Promise Community Health Center also has a contract with Creative Living Center of Rock Valley to provide behavioral health therapy services. Rebecca Mangold, a provisionally licensed mental health counselor for Creative Living Center, sees patients 8 a.m.-5 p.m. Wednesdays at Promise. Pedro Ruiz serves as Promise’s full-time behavioral health coordinator and interpreter. SIOUX CENTER – Promise Community Health Center in Sioux Center has been awarded a $45,361 grant for health information technology enhancements. The grant was awarded through the Delivery System Health Information Investment program of the U.S. Department of Health and Human Services. The funds will be used toward the purchase of equipment and supplies to upgrade an aging server and technology infrastructure to support the expansion of integrated services and the transition to value-based care. The project also involves the purchase of equipment and software for the implementation of telehealth services. More than $87 million was awarded through the grant program to 1,310 health centers in all 50 states, the District of Columbia, Puerto Rico, the Virgin Islands and the Pacific Basin. Iowa’s 14 community health centers were awarded $838,044. The grant program’s purpose is to provide one-time support for health information technology enhancements that accelerate health centers’ transition to value-based models of care, improve efforts to share and use information to support better health decisions for patients, and increase engagement in delivery system transformation. It was the first significant investment directly awarded to health centers to support the purchase of health information technology since 2009. Dykstra said the grant will give Promise the technological capacity to continue to be competitive and on the frontline of delivering care. She noted that health care is making a significant paradigm shift from volume-based care to value-based care, which requires health-care facilities to demonstrate that what they’re doing and how they’re doing it is quality care for the patient. The grant also will give Promise and other community health centers across Iowa the ability to implement telehealth services to connect patients directly with specialists through University of Iowa Health Care. That will allow Promise to be able to care for patients who otherwise might have been referred elsewhere to specialists. “What these specialties might be still is being looked at,” Dykstra said. 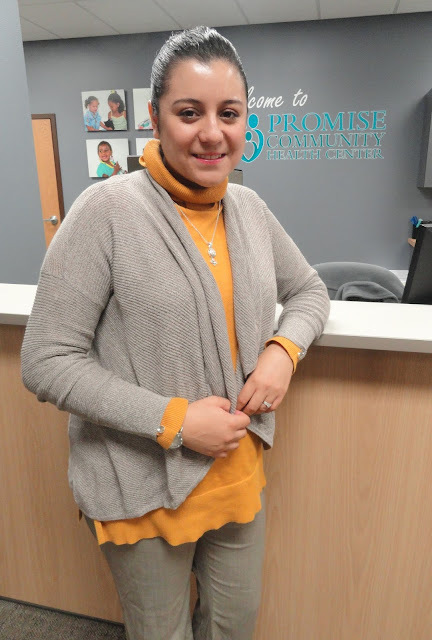 SIOUX CENTER – Karina Gonzalez did not know what her future held for her when she visited Promise Community Health Center for the first time. make sure they have a good visit to the health center. That first visit ended with an application in her hand and, ultimately, led to a job at Promise. Karina, who is bilingual in English and Spanish, recently assumed the position of receptionist at the health center. Karina grew up up in Los Angeles. Her family moved in 2009 to Sioux City, where she graduated from North High School in 2012. 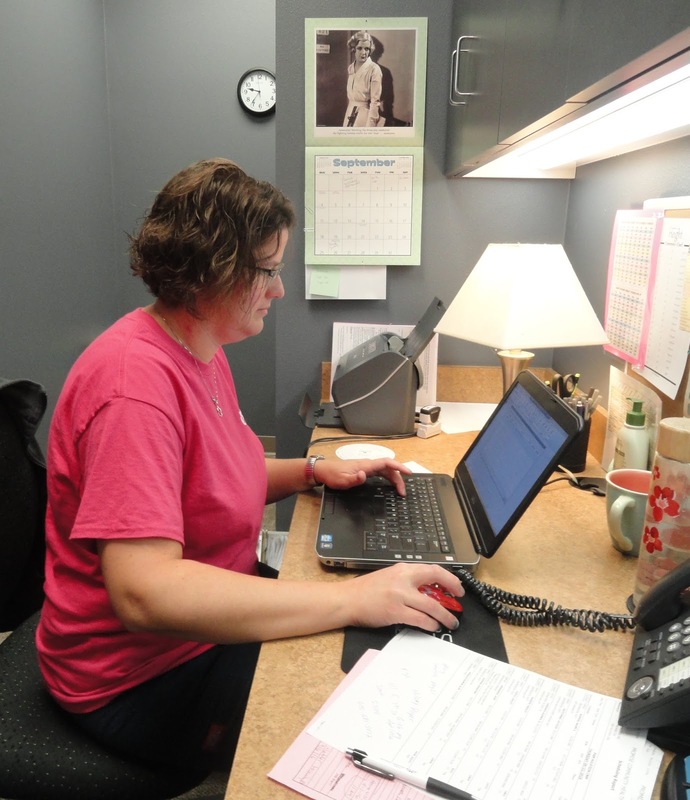 She attended Northeast Community College in the South Sioux City Extended Campus for a couple of years, but she was undecided on her field of study. She might eventually to go back to college. 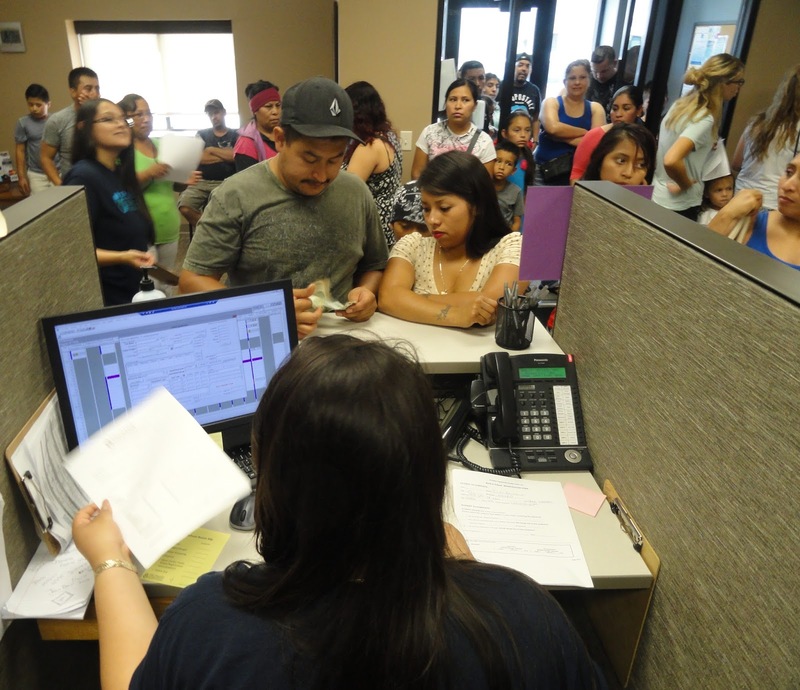 Karina and her husband, Rodrigo Gonzalez, moved to Sioux Center in May 2015. She then worked for Sioux Center Health for over a year as a collection specialist, interpreter and admissions representative. 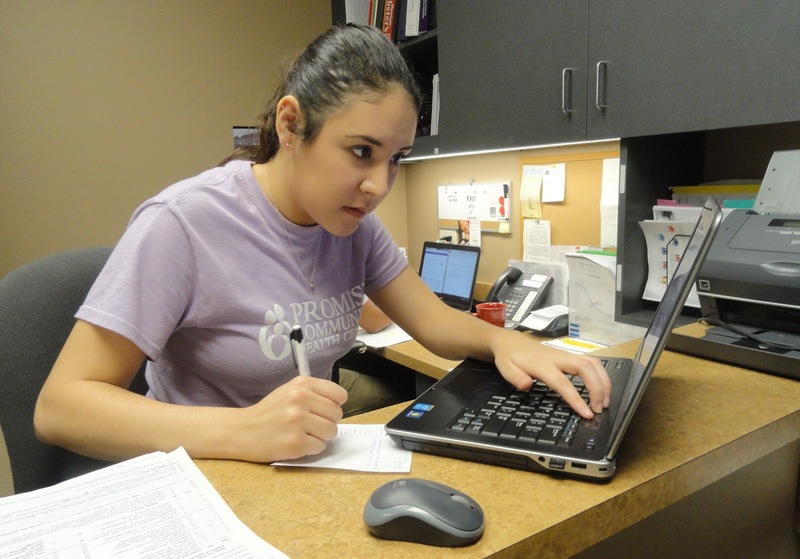 She’s now happy to be serving patients as a receptionist at Promise. Karina Gonzalez and her husband, Rodrigo, who is the pastor of Iglesia Pentecostes Jesucristo el Buen Pastor in Sioux Center, are excited to be expecting their first baby in 2017. Karina likes spending time with her husband and going to church. She enjoys photography, art and music and hopes to learn the piano someday. 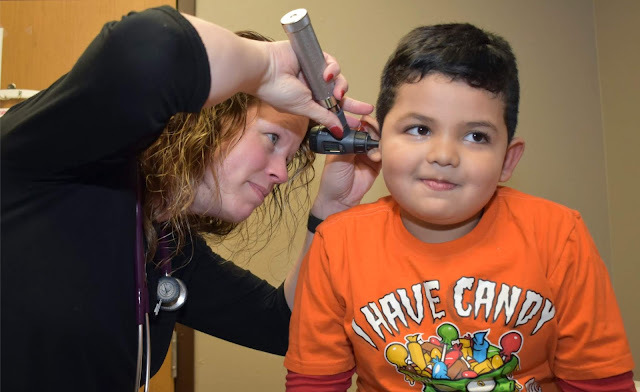 SIOUX CENTER – Promise Community Health Center shattered its record for the number of children who were provided health screenings during its seventh annual Back-to-School Block Party on Wednesday, Aug. 17.
during the Back-to-School Block Party on Aug. 17. The total of 184 easily topped the 126 children served in 2015 and 104 in 2014. Along with the children who received screenings, many more people enjoyed the block party meal and activities outside of the health center in downtown Sioux Center. The event celebrated National Health Center Week. The 184 students received at least one of the four health services offered – with many of them receiving multiple services. Block Party at Promise CHC on Aug. 17. 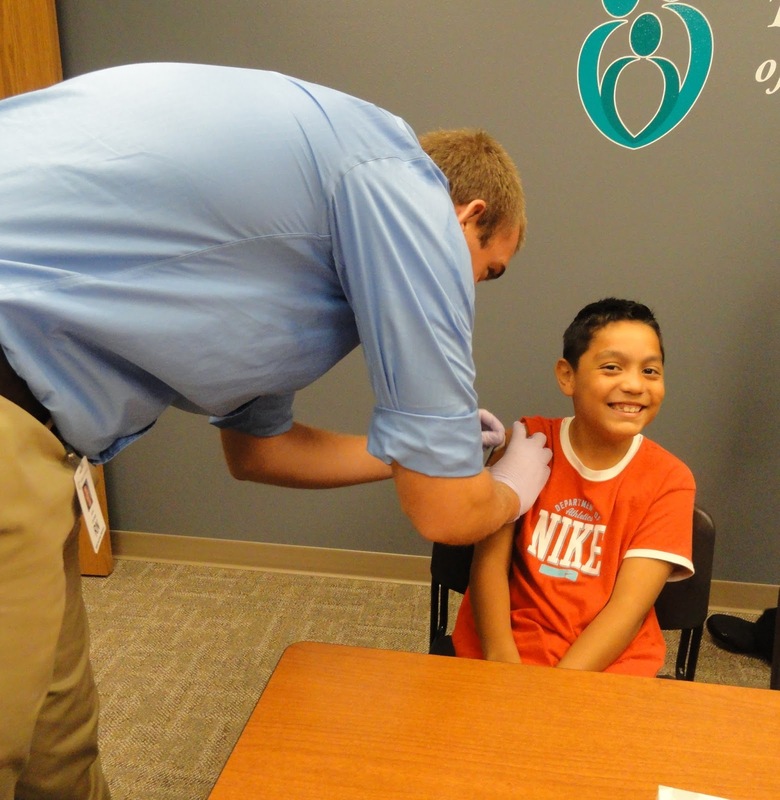 As a breakdown, 110 students – or 17 more than last year – received low-cost physicals. Eighty youth – double of last year’s total of 40 – were given free immunizations. 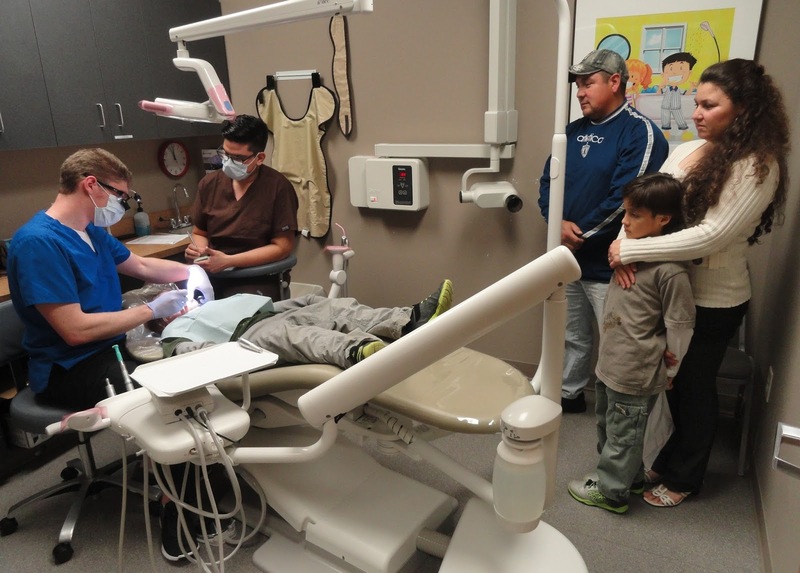 No official numbers were available for the free dental and vision screenings, but an estimated 75 children were served with each of those services. The vision screenings were provided for the first time. The children, their families and many others from the community also enjoyed block party activities in the parking area and alley behind the health center during the four-hour event. Promise CHC and several Sioux Center area organizations – Sioux Center Public Library, Mid-Sioux Opportunity, Seasons Center for Behavioral Health and Compass Pointe – offered interactive and educational games. KSOU Radio served a free hot dog meal. Cinema 5 Theatres provided free popcorn. In addition, Sioux Center Health did car-seat safety checks – making adjustments to ensure the seats were safely secured in vehicles and replacing car seats no longer in good condition with new ones. Sioux Center School District personnel helped Spanish-speaking parents with school registrations. Dordt College volleyball players and Sioux Center High School students volunteered their time to help with the block party and the screenings. at Promise Community Health Center. Promise gave away more than 150 drawstring bags filled with school and hygiene supplies to students, thanks in large part to a $500 grant from the Walmart Foundation. Delta Dental of Iowa donated toothbrushes, toothpaste and floss for the bags. Area political leaders visited and toured Promise during the block party: Iowa Sen. Randy Feenstra (R-Hull), Iowa Rep. John Kooiker (R-Boyden) and Skyler Wheeler of Orange City, Republican nominee for the Iowa House of Representatives. Jerry Self, regional director from the Sioux City office of U.S. Sen. Joni Ernst (R-Iowa), also took the time to visit. To get a better feel for what the event was like, check out the many photos on multiple posts on Promise Community Health Center’s Facebook page at www.facebook.com/PromiseCHC/. SIOUX CENTER – Gabbie Lynch loved going to the dentist as a kid. Yes, it’s true. She had a great dentist with great assistants whom she looked up to. And that got her interested in going into the dental field. Now, as a new dental assistant at Promise Community Health Center in Sioux Center, Gabbie can offer that same level of care to the patients who come into Promise Community Health Center in Sioux Center. Gabbie grew up in Sloan, IA, and graduated from Westwood High School in 2015. She earned her dental assistant diploma from Western Iowa Tech Community College in Sioux City in May 2016 and is nitrous certified. 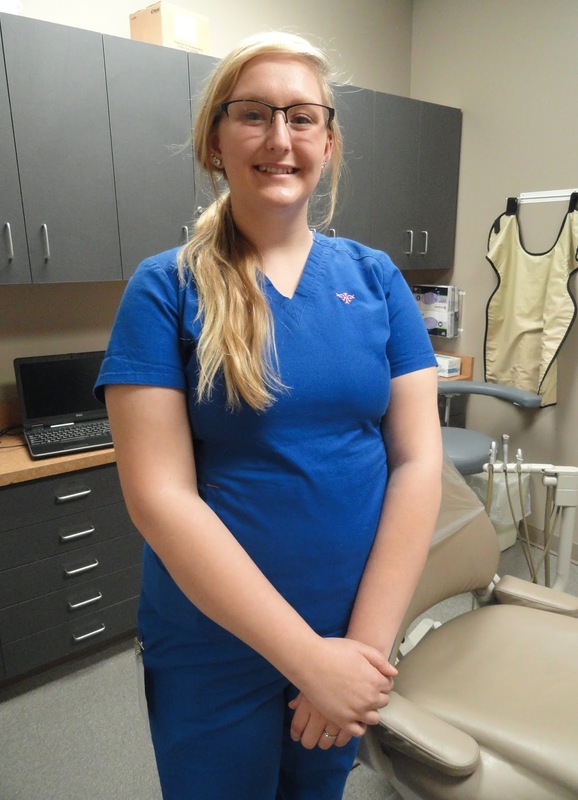 She worked at Dunes Dental 4 Kids in Dakota Dunes, SD, for her second session of clinicals earlier this year and during the summer before assuming her position at Promise in August. Gabbie has been impressed by Promise so far. “They really care about their patients and the work they do, and they’re all so friendly and welcoming,” she said. Promise Community Health Center of Sioux Center is the only Federally Qualified Health Center serving the far northwest corner of Iowa. Promise provides medical, prenatal, dental, vision and behavioral health care as its core services. To learn more, visit www.promisechc.org and watch this video. Gabbie Lynch lives in Sioux Center. In her free time, she enjoys relaxing by watching “The Walking Dead,” “Grey’s Anatomy” and “Orange is the New Black” on Netflix; going to new movies; and hanging out with family and friends. SIOUX CENTER – Promise Community Health Center will offer two Flu Vaccine Clinics this fall. 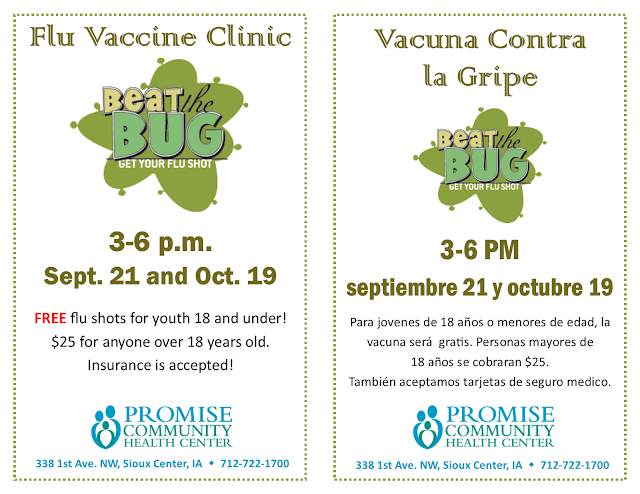 3-6 p.m. Wednesday, Oct. 19.
will offer the flu shots 3-6 p.m. Sept. 21 and Oct. 19. The influenza vaccine shots are free for youth 18 years old and under and $25 for anyone over 18 years old. Promise also accepts insurance to cover the cost of the flu vaccines. No appointments are necessary. People can walk in at any time during the flu clinics. Any child between the ages of 6-35 months will need to get two half doses that are at least 28 days apart. Therefore, parents of those children are encouraged to attend both flu clinic dates so both doses can be given to their child. Otherwise, a special appointment will need to be made for the second dose. This year, the nasal mist will not be offered due to the Centers of Disease Control’s recommendation on the effectiveness of the vaccination method. The CDC does strongly recommend the flu vaccine shot, however. According to the CDC, influenza is a serious disease that can lead to hospitalization and even death. The annual flu season can begin as early as October and last as late as May. During the past 31 flu seasons, the CDC has estimated that influenza deaths annually have ranged from as low as 3,000 to as high as 49,000. The annual vaccine protects against the influenza virus strains that research has indicated will be the most common during the upcoming flu season, according to the CDC. People are protected against those infection strains after antibodies are developed in the body about two weeks following the vaccination. To learn more about the flu vaccine, visit the CDC key facts page at www.cdc.gov/flu/protect/keyfacts.htm. Promise Community Health Center of Sioux Center is the only Federally Qualified Health Center in the far northwest corner of Iowa. Promise provides medical, prenatal, dental, vision and behavioral health services. To learn more, visit www.promisechc.org or watch this video.